A large number of camp prisoners died of typhus, including Anne Frank. Of course, you have to mention that the reason they got typhus was because they were forced into a work camp and tortured. I assure you, neither a large black spider whose name I don't know, nor a large black man whose name I don't know are hiding in my house. Not even sure what message that picture was trying to convey. 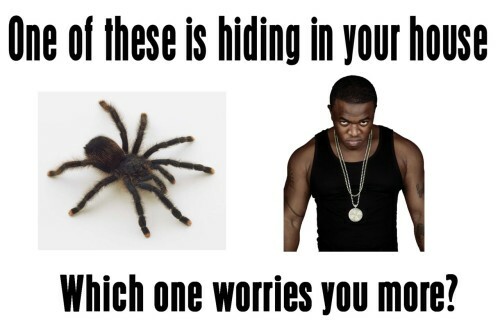 If both are hiding in my house, then obviously I fear the black man more than the spider. Not because he is black, but because he is a man - a human being, capable of using tools and intelligence to inflict far more pain than a spider could ever dream of. Also, because I can't squish him underfoot. In my dream, I am the star. It's me. Speak for yourself. I once accidentally squished a black man... I'm still living down the accusations of racism. I Didn't see him, alright!? HE WAS JUST THERE! You didnÃ¢â‚¬â„¢t see him, huh? Well, then I guess youÃ¢â‚¬â„¢re just one of those sneaky racists that just canÃ¢â‚¬â„¢t be bothered to acknowledge your fellow man. Geez, youÃ¢â‚¬â„¢re worse than the blatant bigots! Don't Steal Him. We Need Him. He Makes Us Cool! But it was night time. I'd be more baffled as to how a giant tarantula and an angry man with dog tags managed to get past the deadbolt. Also, how do I know that the man hiding in my house isn't actually a friend about to throw a surprise party in my honor? The spider. The spider scares me more because my house is small and I'd know if there was a person hiding there. Also, since when is birth control on par with nuclear weapons? No matter if you disagree with its use, that's like saying using insecticide on a beehive is the same as genocide. Woooooooooow...the artist really is an adorable little prick, isn't he? Oh wow...Oh....I need to sit down for a second. Because mass disease could never be a weapon used as part of a policy of genocide. Never. I want to know why all those German pubic servants and prominent Nazis faked evidence to indict themselves of horrifying crimes. And where did all those Jews, gypsies, homosexuals and political opponents go? Ultimate Paragon admits to fabricating a hit piece on Politico. The party's name is the Democratic Party. It has been since 1830. Please spell correctly. "The party must go wholly one way or wholly the other. It cannot face in both directions at the same time."